We flew into Zurich Switzerland two-nights prior to our cruise which allowed us enough free time to explore the city on our own. We purchased a Zurich City Pass (26 Euro) and this allowed us to transfer by train from our hotel to the city center, where we boarded a web of trams to get around the city. We stopped at some local coffee shops, sampled roasted chestnuts from a street vendor, and visited the Zurich Zoo as we explored the city. The next morning, we enjoyed a nice breakfast buffet at the Movenpick Hotel, which was included as part of our Avalon pre-night hotel package. By 10:00 AM, we were boarding a motorcoach for pre-cruise optional excursions to see Mount Pilatus. The views were breathtaking, and the adventure of riding the world’s steepest cogwheel up the side of the mountains was amazing. After our visit, the tour bus headed to Lucerne for a short tour of the city and stopped at the local chocolatier. We loaded up with sweets, and began our hour ride to Basel to board our ship the Tranquility II. We said our good-byes to our local host, and boarded the ship. Our cabin was great, with panoramic views and sliding glass doors, and floor to ceiling windows. We enjoyed a welcome reception and the Captain’s welcome dinner. We woke up this morning to partly sunny weather and a visit to the historic city centre of Strasbourg France, a Unesco World Heritage Site. We learned about the history of this 2000 year old medieval city and how often it changed hands between French and Germans. We visited the La Petite France district and the gothic cathedral. After a delicious on-board dinner, we enjoyed evening entertainment of La Strada in the lounge with guitar player and a French singer performing classical music. After a full breakfast buffet, we joined in with other Avalon guests for a walking tour of Speyer, Germany. 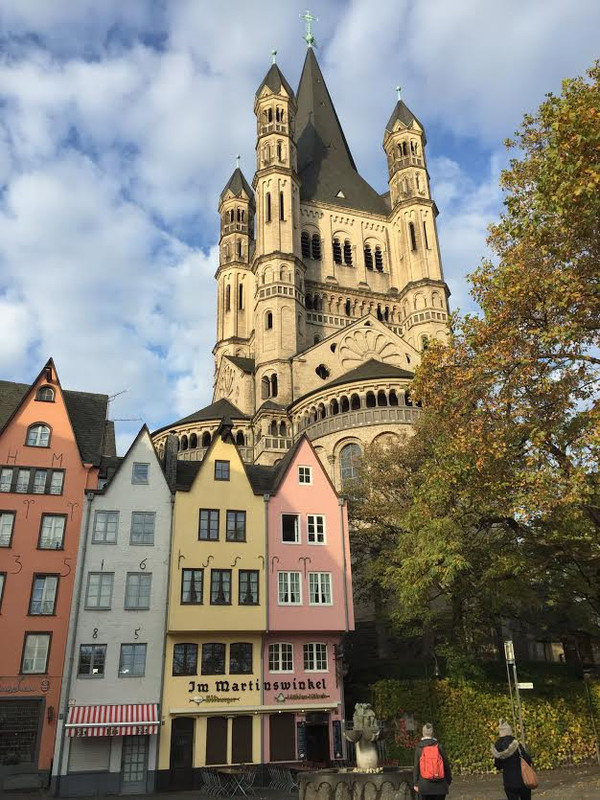 We visited the Speyer Cathedral, which is the largest fully intact Romanesque buildings in Europe. We returned to the ship for a warm lunch buffet in the main dining room that had a great selection of items to choose from. We arrived in Heidelberg, Germany, which included a visit to the Heidelberg Schloss Castle ruins. The ruins are truly impressive, and it still has many of its original walls standing, which remained undamaged during the war. Our tour guide pointed out the area where American writer Mark Twain stayed, and heard antidotes about the famous author and his ties to Heidelberg. The views from the castle overlooking the city and riverbanks below the castle are truly amazing. Heidelberg is home to one of Germany’s most prestigious universities. Before leaving the castle ruins, we visited the world’s biggest wine vat; this huge barrel was built in 1751 and is housed within the Heidelberg castle. We woke up to another partly sunny day on the river and a full breakfast started our day off right. We enjoyed the scheduled walking tour of Mainz, Germany. Here, our local tour guide showed us through the Gutenberg Museum, and we viewed a live demonstration of the mechanical moving-type press which was invented by Blacksmith Johannes Gutenberg in 1450. After this lovely demonstration, our group headed upstairs in the museum to view the Gutenberg Bibles display. Next we headed to the main square and visited the outdoor market filled with vendors selling flowers, produce, meats, and pastries, where we sampled some baked goods before heading back to the ship. We took a trolley bus to get to the Siegfried’s Mechanical Musical Instrument Museum, which turned out to be a very charming and entertaining museum with more than 350 exhibits, including self-playing mechanical musical instruments to piano-orchestra. The town of Rüdesheim is quaint, with half-timbered houses, narrow cobblestone streets, and shops. 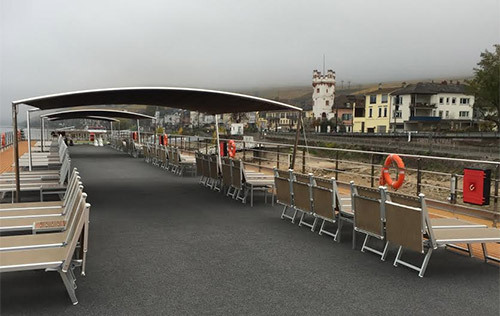 We found the locals to be warm and friendly and we capped off our visit with a famous Rüdesheim coffee before heading back to the ship. After another superb dinner, we enjoyed evening entertainment on board the ship, provided by the ship’s staff. It was a hilarious and very entertaining show. We sailed through the Rhine Gorge on a nice sunny day in Upper Middle Rhine Valley, Germany. We sailed through 66 kilometers of winding river banks, steep slopes, vineyards, and historic towns. The sites were pleasant to witness during our journey, and the Avalon Cruise Director gave commentary as we sailed past the castles. Music played throughout the ship while making our way past Lorelei Rock. We lounged on the Sun Deck of the ship and sipped hot drinks served by the ship’s staff, which were delicious and kept us warm with the cool winds blowing on the top deck. We soaked in the beauty that the Rhine has to offer, it was the best day ever! The next stop was Koblenz, Germany. Here, we chose to explore on our own, we chatted up with some locals and found some treasures to bring home from the local antique and specialty shops. We enjoyed another incredible four-course dinner in the ships restaurant, with a selection of appetizers, soups, salad, main course, and dessert. The wine menu offered a nice assortment of regional wines. We signed up for the easy walker group, which walked at a slower pace so that we had more time to snap photos, so we ended up in a very small group of eight, including the local guide. We toured Cologne and the main hallmark attraction the French Gothic Masterpiece Cologne Cathedral that took over six centuries to build. We learned that it can house over 20,000 people, and is visually amazing. We viewed the gold- incased shrine where the bones of the three Wiseman are said to be laid. 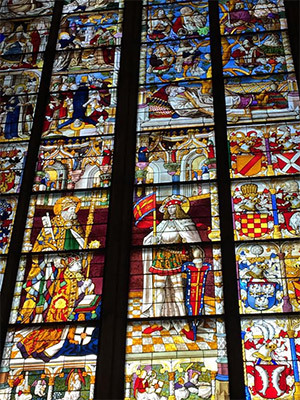 We admired the stunning stained-glass window and high archways. After the walking tour ended, we had free time to sample the German bread in the open air cafes. We also visited the chocolate shops and souvenir shops before making our way back to the ship. That night on board the ship, we had a special Captain’s Farewell Gala Dinner, and afterwards, we sailed throughout the night in the rain on our way to Amsterdam and enjoyed the comforts of are warm cozy cabin. This morning we woke up in Amsterdam, Holland, and the first thing we noticed on our canal cruise was the many canals, bridges, and bicycles in this stunningly beautiful city. We took a short tour to get acquainted with the city, and then our tour group split up in different directions, some headed to the Anne Frank House and Museums as they ventured around the city. We disembarked the ship at 10:00AM, which is when all the guests were required to be off the ship. We took the Motorcoach provided by Avalon to the Amsterdam airport for our return flight home, brimming with memories that will last a lifetime!